Hello, Just bought an new '18 570 EPS. Reading articles and wanted to know if there is anything I can catch early. I put on the CV boot protectors, bumper, windshield, roof and back window. Greased the airbox seal and all fluids are topped. I read the article on the Zirks, think I got them all: the 2 ends of the 4 A-arms, slip joint and 4 sway bushings. Zirks had grease on them but when I pumped in grease, all that came out was mine so I guess they just wipe grease on the zirk to make it look like it was greased. Read something on the rear wheel bearings but unsure what would need to be done? I ziptied a rug to the door nets as someone suggested but it gets dusty with a full windshield. The rug keeps the mud and splashes out but I wondering if it's wort it because it keeps a bunch of dust in as well. Any solutions? eBay "RZR 570 wheel bearing greaser". Need two, front and rear. Thank you Denver, that's the info I am looking for. I guess this just forces grease past the seal and into the bearing? I guess they are dry like everything else so this is a now thing? Looked on ebay, any seller that you guys use here? The spacers/offset wheels are certainly one way to go for added stability. A wider base is going to keep you more planted. I do disagree with the statement that the 570 "can EASILY be put on its side in off camber situations." Metki is correct that widening the stance will make it less easy to roll or flip, but I'm amazed (of course, IMHO) at how stable the stock RZR 570 is in hard turns and off camber situations. I grew up on atv's and stayed away from UTV's because I couldn't use body english on hills, off cambers, tight turns etc... I have the identical year and model RZR as you, and it is currently (although hopefully not for long) still bone stock. If you don't have trail restrictions like 50" trail gates or doing most of your riding on old four-wheeler width trails, then adding width is a great way to go. But I ride curvy trails with steep hills and ravines and I don't ride slowly. As with any tool, you have to learn the limits of your vehicle/device before you push it to the limits of failure or safety. All atv's/utv's are tippy when they are at their limits, some just have much higher limits than others. I still love atv's, but I also love my RZR 570 and am not the least bit worried about putting it on its side. Many more knowledgeable(than me) guys on here will tell you that good aftermarket shocks will not only aid in handling and comfort, but add to the overall stability of the machine as well. Good luck with the new ride, I think you'll love it. steve5657, gmiller0737, Vandal and 1 others like this. To address your dust problem a full skid plate helps with the dust. An inexpensive trick is to get a Harbor Freight movers blanket 40" X 50" is perfect drape it from under the back windshield(it will help hold it in place) down the firewall & under the seats. You will need to make cuts/holes at several places like the gas cap/sidebar mount/shift lever(place under center console housing)/side & center seat belt mounts/front seat brace & seat lock post. Also duct tape the larger cracks/openings around the firewall & roll bar. 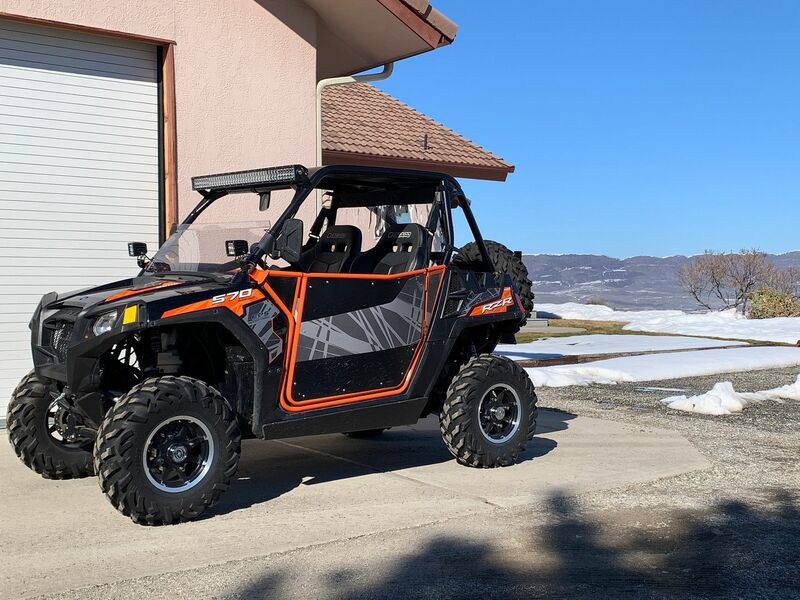 2013 570 LE, 26" Kendra HTRs, Bandit 46 Sport shocks, Desert Molding Concepts Suspension Seat Brackets, Polaris 4500 lb winch, Trail Armor doors, CB roof, F&R windshields, Heater Craft heater, custom side windows, turn signals, 2 custom gun mounts, Tusk skid plate, 20" light bar, Dalton Clutch Kit, & lots of other goodies!!! Last edited by MLK65; March 22nd, 2019 at 10:54 AM. Denver and cecil_bunkford like this. Thank you for the moving blanket tip, I will look into it. I shoved two pool noodles in each front wheel well and zip tied to fill that huge gap. Taped them with electric tape and they disappear. As for going wider, 50" is best for my area. MLK65 and cecil_bunkford like this. What you NEED to do?? Greasing the zerks is a great maintenance thing. Keeping your air filter clean/fresh, mandatory. Rear window is good for slowing dust down. Quality shocks, removing swaybars, sure. And of course you can upgrade to no end. What you NEED to do is go use it, and find out for yourself what YOU would like to do. You can read page after page here on what many of us upgrade on our 570's. What you NEED to do may be minimal. What you WANT to do may be ENDLESS!! Owner beware! LOL ...It becomes a fever. steve5657, Denver and Vandal like this. Maxpolaris, I hear ya. Needs vs wants. I really got this to ride along when my son drives, the 170 was a knee knocker. I have tight trees and woods to ride and the thing feels good. I have ripped it and feel the sway bars are good, don't have any crawling by me. To the other guys, I will keep shocks in mind. I felt the seat crossbar yesterday, where the backrest and seat bottom meet. Looks like upgraded seats could be sweet as yours look different than stock. Adding 4 grease fittings to the rear bushings tomorrow, looking into the wheel bearing greasers as well. That is the exact reason we have Beard seats - the wife felt the irritating piece at the bottom of the stocks seats, from brand new. Easy upgrade when the wife says go for it. Beard seats are awesome but don't drain water - PRP might be a better choice (or draining seats anyway). Plus... you might need seat lowering bases as aftermarket seats can sit you higher than stock. Deviating from stock always makes for extra parts needed... I never learn. Listen to Maxpolaris. Each of our machines are as unique as the terreign and driving style of each driver. I set mine up for 50" trail with tall wheels and tires, ground clearence items, shocks, no sway bars and aftermarket skid plate because I hunt in Idaho and need those things for what I do. I did all the cab stuff for creature comforts that help keep me out longer. Find the niche you need your machine to fit into based on the conditions you drive. Chances are, you'll find what you want and your wallet will hemorage for it. It's been said here a few times that just buying your RZR is just the down payment for the addiction. steve5657, Beanhead, MLK65 and 1 others like this. MLK65, you nailed it with the Harbor Freight moving blanket. I caulked all the openings in the front especially the leaky floor to firewall joint but the back was where you could see all the openings. I made floor mats out of Harbor Freight 2x2 foam floor mats and that seemed to knock down on the noise of sticks banging the skid plate. Yesterday was practically a dust free day. Thank you. Denver, I got the greasers, great invention. When I pulled one rotor/hub off the bearing pulled apart, 10.2 Hrs on the machine : ) All good now.